Steel-Craft Door Products Ltd. is a leading manufacturer and distributor of residential, commercial and industrial doors, with sales and distribution sites across Canada. The company’s IT team, headed by Robert McArthur, National Information Technology Manager, provides network administration and support across a group of businesses and branch locations from Steel-Craft’s headquarters in Edmonton, Alberta. Inconsistent network performance that frustrates workers and limits productivity. Like many nationwide businesses, Steel-Craft’s operations rely on a strong, wide-area network infrastructure. However, inconsistent performance, particularly in remote locations, and increasing costs were impacting productivity. In Saskatchewan, for example, a restricted 5 Mbps connection from a legacy provider resulted in slow file transfers, patchy VoIP connectivity and insufficient bandwidth for remote desktop support and negatively impacted Steel-Craft’s operations. “It worked, but if we needed to remote-in to solve an issue, it could bring the branch down”, McArthur remembers. A cost-effective business internet service, tailored to the client’s needs. A comprehensive review of alternative providers, led by Sunco, convinced Steel-Craft to migrate their services to a new partner. Leveraging a strong channel partnership with Bell, Sunco developed a tailored Multi-Protocol Label Switching (MPLS) wide area network solution that would deliver both the reliability and performance that Steel-Craft required. 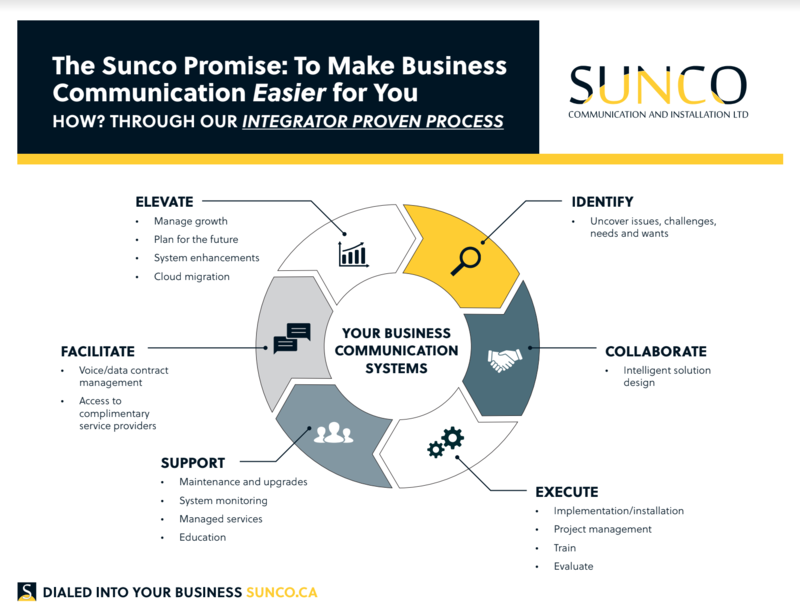 This private network solution was created using Sunco’s Integrator Proven Process, a collaborative approach to solution design that matches industry-leading service and support features to individual business needs. The plan would be to install new equipment to all of Steel-Craft’s sites in a phased roll-out over several months. But not all branches were able to make the move immediately. “At our Surrey location for instance, we were told that it could take up to a year to get the required permits and permissions to install the line that we needed for the new Bell network,” recalled McArthur. “That simply wasn’t going to work for us”. Thanks to the work already completed through the Integrator Proven Process, Sunco was able to quickly propose an alternative solution for the Surrey branch, which involved a Telus fiber connection. Offering high speeds and superior business continuity features such as LTE failover, the Telus service was installed at the branch without delay. This flexible, multi-provider approach ensured all Steel-Craft sites could be upgraded within the agreed time and cost schedule. ”When it looked like our migration plan was in trouble, Mike and the Sunco team stepped up and got the job done. We now have full 100 Mbps bandwidth both ways at all locations and it’s been solid,” says McArthur. Strong relationships with all of Canada’s major internet providers ensures Sunco is well positioned to find the right business internet solution for your organization at an attractive price. Learn more about Sunco’s business internet services and get in touch to discuss how working together can boost business productivity and reduce costs.